I LOVE HER! Great job! This is AMAZING You look just like her! This is one of the characters from my childhood that STILL deeply creeps me out to this day. Wow this is so cool! I loved Hexadecimal as a kid and I was so obsessed with ReBoot. Awesome!! Now here's a cosplay I never expected to see. Well done! Greatest...show...ever! Loved Reboot back in the day. Awesome Hex costume! The expression on the mask is perfect. why is the wall like that? Because it was the outside of a building. I have to ask too. It's obviously the outside of a building, but he means why is that brickwork crooked and seeming to float off the ground? Even its bottom shadow doesn't match up. It's just eye-grabbingly strange, though very Hex. Idk, it was just how the outside building design was and where I was standing? O_o lol idk. Then by coincidence, it worked for ol' Hexy. Good choice for a spot. 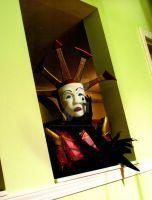 Fantastic Hexadecimal costume! You look AMAZING!!! I love the mask you chose too! Have you thought of making interchangeable ones? My sister and I will be cosplaying Mouse and Enzo this year at Dragon*Con, we might have a Bob too. I don't suppose that there's any chance you might be attending that convention? I currently have two masks that I can change between. The original plan was to make more but I ran out of time for CCEE. But I plan to make others later. I WAS hoping to go to DCon, but lack of funds so I don't think I'll be able to this year. Oh no, that's too bad. Well we go to a few cons on the East Coast of the US each year, so if you are ever in town in Virginia or Maryland for a convention with Hexadecimal, please do let us know! ♥ There is always Dragon*Con next year, too. I can't wait to see more photos of your costume, you look great! Aw, I miss this series. Awesome job on the costume ! I love this! Truly creative, and there needs to be more Reboot Cosplay anyway. Top marks! Ah sweet memories ^^ Wish they would continue the series. also great idea on putting the badge on your boots..unless it wasn't fittin on putting around the neck? Nah I just hate wearing landyards, plus if I wore it around my neck it would ruin any photos being taken. I totally forgot to take it off during these pics though.